Guide to the Freshwater Crustacea of New Zealand, ISBN: 9780473201753 - available from Nationwide Book Distributors Ltd NZ. 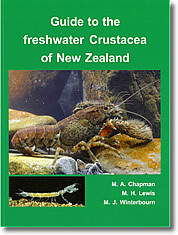 Guide to the freshwater Crustacea of New Zealand is a comprehensive update of the classic volume Introduction to the freshwater Crustacea of N.Z. by Chapman & Lewis (1976). In the intervening 35 years there have been many advances in the systematics of crustaceans leading in many instances to the introduction of new names, and our knowledge of freshwater crustacean biology and ecology has increased substantially. The new book follows a similar format to its predecessor, uses some of the same text, and many of the original figures. However, most of the text and identification keys have been rewritten to accommodate advances in knowledge, and many new line drawings and colour images are included. Each chapter has its own set of references to help users access the relevant literature. Accounts of the Copepoda, Syncarida, and Amphipoda, in particular, contain much new material, and information on the remarkable subterranean and ‘terrestrial’ crustacean faunas is incorporated. The book is intended to be a source of information and a guide to the identification of our inland crustacean fauna that can be used by students, teachers, research workers, and other environmental scientists.